BeetleBlock MCH - AgBio, Inc.
2017 Report on "The Health of Colorado's Forests" published by the Colorado State Forest Service. 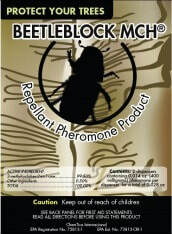 BeetleBlock-MCH is the anti-aggregation pheromone that repels Douglas Fir Beetles and Spruce Beetles in an area or individual trees. The pheromone repellent is enclosed in a controlled release dispenser that is stapled or nailed to trees during the beetle season. Control of both Douglas-Fir and Spruce Beetles has been excellent as demonstrated by the USFS and State Foresters. Simply staple or nail a dispenser to the trunk of the tree at a height of 6 ft.
See label for application directions depending on single trees or an area. Want more info on MCH?